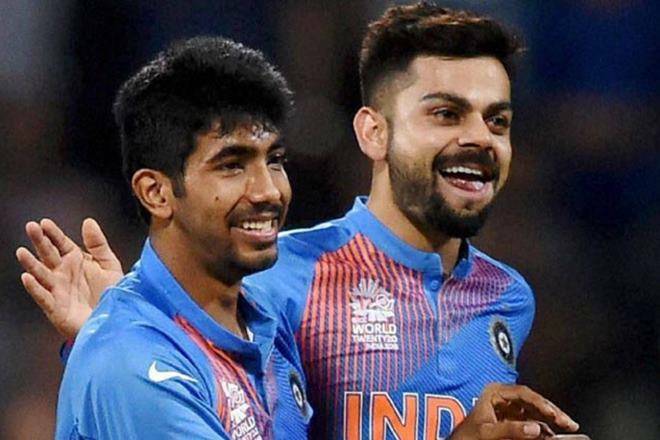 Dubai(PTI): India pacer Jasprit Bumrah has risen to second in the latest ICC Twenty20 rankings while skipper Virat Kohli has retained the top spot in the batsmen’s list. There is no change in the top three of the all-rounders’ table which is headed by Shakib Al Hasan of Bangladesh. Pakistan’s ICC Champions Trophy-winning side’s member Imad Wasim has become the number-one ranked T20 bowler after South Africa’s Imran Tahir lost ground following the conclusion of the series against England. In the latest rankings for T20 bowlers, which was updated a day after England beat South Africa 2-1, Tahir has slipped two places after he managed only one wicket in two matches. His drop to third means Imad has surged to the top for the first time in his career, with Bumrah rising to second. In the batting table, Kohli, Aaron Finch of Australia and Kane Williamson of New Zealand have retained the top three positions. However, AB de Villiers and Jason Roy are the biggest movers following the just-concluded series. De Villiers, who was the leading run-getter in the series with 146 runs, has returned to the top 20 in 20th position after rising 12 places, while Roy’s series aggregate of 103 runs has helped him achieve a career-high 25th position after jumping 26 places. In the team rankings, England has moved into outright second position. It had started the series level with Pakistan on 121 points, but has now moved to 123 points to trail number-one ranked New Zealand by two points. In contrast, South Africa has dropped one point to join Australia on 110 points. However, it is ranked ahead of Australia by a fraction of a point, and occupies the sixth position.